Sometimes you're paused in a delicious place and time and you don't want it to end. Some friends have created a truly beautiful lake; an oasis that is a testament to their creativity and hard work. As we slipped in, on a thundery and threatening day, the water enveloped us in its silky softness. We swam around surrounded by clouds of wild flowers. Then it was time for some sychronised diving off the little jetty. Ladram Bay is home to a procession of stark sandstone stacks, with names ranging from the sublime to the ridiculous. Chocolate Finger, Ladram Lady, the Tower of Babel, Bonnetti Tower, the Razor and Lost World. 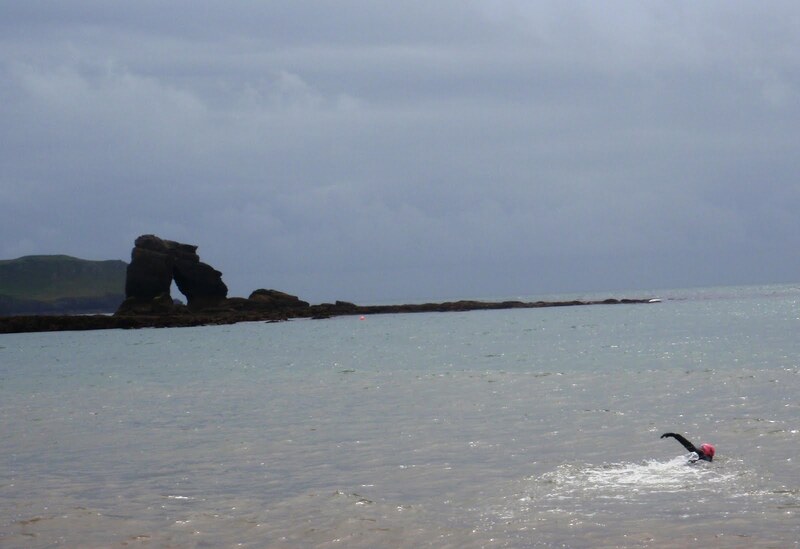 We started our swim amongst the pebbles and people of Ladram Bay itself...but a short distance around the corner and we were in pure desert nature. Burning red cliffs and bright blue sea, and the stacks dotted wherever we looked. Some were peppered with holes and tunnels, most had caves forming at their foundations, because of the constant whirl of the sea. It was like swimming through the Grand Canyon. It was a very low tide at Thurlestone. So much so that I got to the Rock by clambering across the reef, as well as swimming. I spent ages wallowing around in the various rock pools, marvelling at the myriad seaweeds in all shades of green, brown and pink. I saw a small wrasse and many shoals of fry as well as the odd prawn. There is an enormous pool underneath the Rock itself lined with pebbles in a huge range of colours. I went under the arch and round the outside; it's a spectacularly grand place. As I swam across the Secret Lake small raindrops bounced on the surface, like delicate pin pricks. The water was dark and peaty, and colder than usual. It took my eyes a while to get used to the underwater blackness, but eventually I started to make out the silty bottom and clumps of weeds, occasionally punctuated with a large granite boulder. This place is an oasis of silky calm. The amazing thing about the tide is it creates swimming places which appear and disappear almost by magic. In Cornwall, with friends, we swam in the bluest, clearest channel of water; an hour or two earlier or later and it wouldn't have been there. When you catch the right time, there is a great sense of the moment. As we waded into the beautiful lagoon the water got clearer and bluer, and the great walls of cliff loomed up either side. We dived and swam to our hearts' content. Sheer heaven. Watch the movie here!